This is an edited transcript of my presentation at Rebel Jam, a global 24-hour long conference on positively changing business, government, education, healthcare, and the world itself. You can find my slides here. 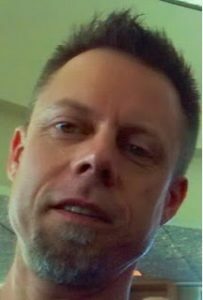 I am an Agile transformation leader helping big and small organizations do amazing things. I use Agile and other transformation tools to do this. I recently worked for Nokia, a rather large company. 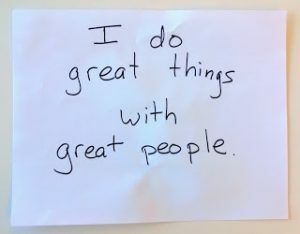 I currently work independently, helping businesses transform themselves toward greatness, and helping a community group set a world record in West Haven, Connecticut, USA. I help people understand what they have and what they want. I use a bunch of practices related to movements like ours to help people know what they have and transform it to what they want. I woke up one morning this spring with an epiphany: work hurts, and I think I understand why. Many of us do amazingly creative work. We love what we do. Our work fully engages our hearts and our minds. But it’s painful to do our work at work. It’s painful to do it at our workplaces. It’s painful to do it within the hierarchical command-and-control structures of the organizations that we work within. Work hurts. How would you succeed in a world of limited resources? I thought about why work hurts. Work hurts because we are doing creative work, “knowledge work,” but we’re doing it within industrial control structures. Industrial control structures, industrial management systems, industrialism in general: industrialism is a good thing. It makes sense. It makes sense in a world of limited resources. 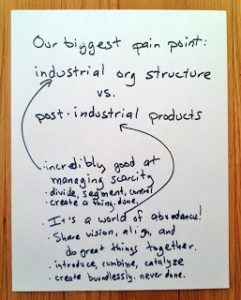 If you have limited resources, limited raw materials, and you want to transform them into something good, something valuable, you apply industrialism. Your limited resources are things like coal, metals, springs, bearings, cogs, power, people, money, and time. You get the most efficient output from your limited inputs. You efficiently transform your limited inputs into wonderful products that delight people, they give you money for your work, and you profit. That’s good. What if there were no resource constraints? What if you had no resource constraints? What if everything you created derived from the abundance that the universe offers us? Our era is different from the era of the industrialists. Much of what we do is mentally creative work, information work, sometimes called thought work or knowledge work. In a world of software, we can have anything we can code. And this isn’t limited to soft things and computerized things: in a world of inexpensive 3D printers, we can produce any object we can code. This conference shows that we don’t even have to be working together face to face, the way Henry Ford’s workers had to. We are no longer constrained by resources. 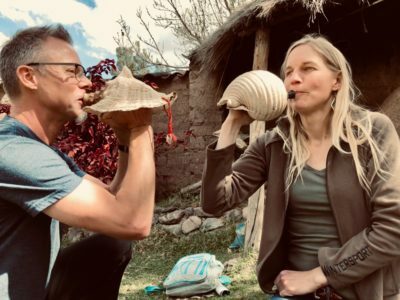 We are not constrained by physical resources (we can code them and 3D-print them), by the availability of people in a particular place, by money (things are cheap). We live in a world of unlimited resources. If we can think it, we can have it. If we can dream it, we can have it. If we can code it, we can have it. Our only limit is our intellect, our dreams, our spirit. I want to give a name to this new era of unlimited resources and possibilities, but I’m not sure what to call it. Industrialism is exactly the right name for our past. What do we call our future? “Post-industrialism” is accurate–it tells us where we came from–but it’s disappointing because it doesn’t describe our destination. “Post-scarcity economics” is another accurate term that people have begun using, but like post-industrialism, it only describes our past, not our future, so it dissatisfies. People use the term “knowledge work” to contrast the creative work we do against the work done on the industrial factory floor. But I want to avoid the term knowledge work because it feels divisive. It implies that our industrialist predecessors were not engaged in knowledge work, not engaged in creative intellectual work, and that’s insulting. The industrialists solved the problems of their era amazingly well, perfectly, and they deserve credit for their contributions. They were knowledge workers. 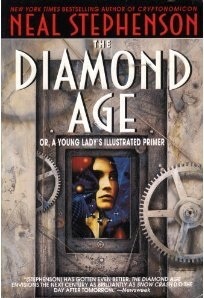 The era that we are entering sounds like the world created by Neal Stephenson in his novel, The Diamond Age: Or, A Young Lady’s Illustrated Primer. The parallel between our world and the one in the novel is that physical goods, even food and basic shelter, are cheap–you can walk up to a vending machine in the street, press a button, and it manufactures physical goods for you out of carbon atoms. For free, anyone can have a bowl of ramen and a mylar blanket. And you can have anything else you want, if you stick some money in the machine. Vending machines in the street are augmented by machines in the home. Programmers who write the code for these matter compilers can produce anything they can dream up; if they can code it, they can have it. In the novel, there are no physical resource constraints. If you can code it, you can have it. Write some code, and a machine creates it for you on the spot out of carbon atoms. That’s the Diamond Age. It sounds a lot like the world we are close to living in. In our current and near-future world, if you can code it, you can have it. So my working name for our upcoming era is the Diamond Age. It’s not perfect, but it’s a good placeholder. In the Diamond Age, industrialism doesn’t make sense. We are not constrained by limited resources. If we can code it, we can have it. That’s the background on why work hurts, and on where we’ve come from and where we’re headed. A few weeks later, I had another epiphany. There are specific thought movements, specific collections of principles and practices, that are helping us make work hurt less; helping us do work that has no resource constraints, although we are still within control structures designed for a world of resource constraints; helping us do Diamond Age work even though we are operating within Industrialist control structures. These movements are all roughly congruent. At their best, they all solve this problem: how to get an amazing outcome with a group of people–how to combine the collective intelligence of a group into a single mind–how to do great things with great people. These movements aren’t exactly the same as each other, they aren’t equivalent, but they are roughly congruent. 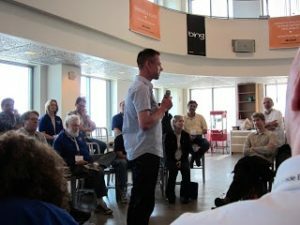 I have been introduced to these movements through the Agile software community, and especially through Agile Boston and Dan Mezick. I use these movements, these principles and practices in my work, doing great things with great people, helping people do amazing things together, helping people know what they have and transform it to what they want. I collect a number of these movements here and I offer a brief description of each one of them. I call this collection Diamond Age-do, or The Way of the Diamond Age. These movements are toolsets that we can use to get amazing outcomes. What do you have? What do you want? The Ways of the Diamond Age help you understand what you have and get what you want in the world of unlimited resources. The Ways of the Diamond Age are the tools I use to help people know what the have and transform it to what they want. Agile software development is the first of the Ways of the Diamond Age. Software developers were one of the first groups of people who were unconstrained by resources–if they could code it, they could have it. Their work hurt, and still does. With no resource constraints, industrial era management doesn’t make sense. In the mid-1990s, Agilists reacted by humanizing and simplifying their work. Agile is about people, getting people to be able to work together well to do great things together, to get amazing results. 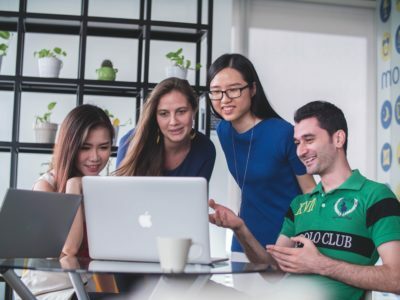 The various flavors of Agile do it in slightly different ways, but the values are the same: people working well together, producing a working product that they can show to other people who care about it, and easily adapting to the changing world around them. Open Space Technology is another of the Ways of the Diamond Age. 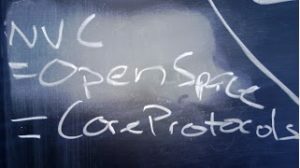 Open Space is about giving people emotional, intellectual, and physical space within which to explore and share their best ideas with each other. It is a tool to help people grieve, to be able to transform through chaos and pain from their past to a beautiful future. 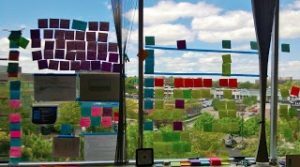 In Open Space, we align around a theme, a thorny problem that no one knows how to solve, that the group hasn’t been able to deal with. We build a safe space for each other to explore. We embrace the moment. We make it OK to opt in and opt out–butterflies and bumblebees. We accept that the outcome we achieve is the only thing that could have happened, and we embrace self- and mutual-responsibility for achieving only the best outcome. 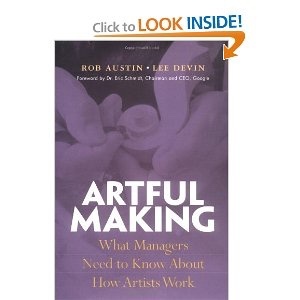 Artful Making is an important contribution to the Way of the Diamond Age from Lee Devin and Robert Austin. Artful Making is about ensemble. Ensemble is a group of people acting as one, making amazing art together. Artful Making compares the best theater companies with the best technology companies. A theater company puts on a new show. They spend six weeks developing the show from a script, a crude guideline of what might happen on stage. They start as individuals, and build a space of trust. They discover ways to make the play amazing. They try new things, most of which don’t work. They support each other as they make mistakes–though they don’t use the word “mistake”–these beautiful accidents are the only way to discover the best ways to do the performance. They create art by creating ensemble. And they always get it done on time: when opening night arrives, they put on a great show on time. Imagine that you know yourself really well. You have high self-awareness. You understand what you want, the one core virtue you seek that will help you reach amazing goals. That’s a great self. Imagine that your friends have the same high self-awareness. Imagine sharing your vulnerabilities and goals with each other. Imagine committing to supporting each other in our deepest, most important goals in life. That’s a great team. Imagine forming a vision together and aligning with it. Imagine working in an open, vulnerable, safe, high trust, high results environment, being great together, producing a great result together, and achieving your world changing vision. That’s greatness. That’s the Core Commitments and Core Protocols, and the Core Bootcamp process. 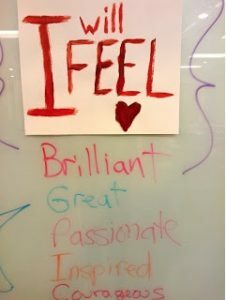 The Core Commitments are a set of affirmations we make to ourselves and to each other. The Core Protocols are a set of behaviors that help us get the best from ourselves and each other. 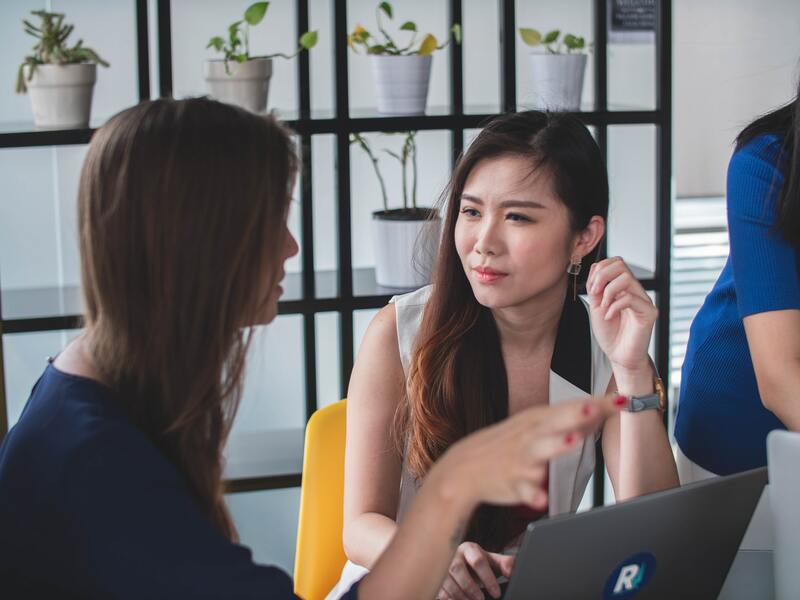 Bootcamp is a way to discover who we are, discover what we want, discover our alignment and vision, and practice the commitments and protocols as we boot ourselves into an amazing team. Nonviolent Communication is another Way of the Diamond Age for knowing yourself and your teammates. It opens space between people to listen to each other and to hear each other. It helps us communicate very clearly, with ultimate safety. The core protocol of NVC is OFNR: Observation, Feeling, Need, Request. When you try to explore an idea or resolve a disagreement with someone, start by stating the facts. Then share your feelings about the facts. Then state what need of yours is unmet. Finally, very clearly, ask for what you want. Imagine a group of people sharing one mind together. Exploring, inventing, creating new ideas, harnessing their collective intellectual power: a hive-mind, in a way. What if there were a way to achieve that collective mind? 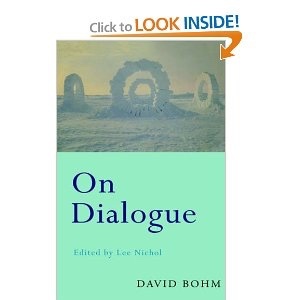 Bohm’s Dialogue is that Way. Open space together. Organically and spontaneously discover the thing you need to discuss and explore. Listen and explore until you’re done. To open space at large scale, we might need some semi-formal processes that ensure we get the best from ourselves. Sociocracy is a way to organize a group of people of any size so that they agree and align on their vision, mission, aims, and policies–what to do–and on their operation–how to do it. Sociocratic groups use consent-based decision making to ensure everyone is aligned and no one has a paramount objection to the group’s policies and operation. Imagine the people of a large city getting together to figure out what is important to them, to guide city policy and agree on how to spend their budget. Imagine that everyone’s voice is heard equally–business owners, wealthy people, poor people, recent immigrants, families, single people, men, women, everyone. Imagine that people listen to each other, get to know each other, build empathy for each other, leave having discovered their commonalities, that their differences matter but that their common wants and needs trump. That their community is vibrant and people care. Imagine that it works, that people leave satisfied with themselves and their city. 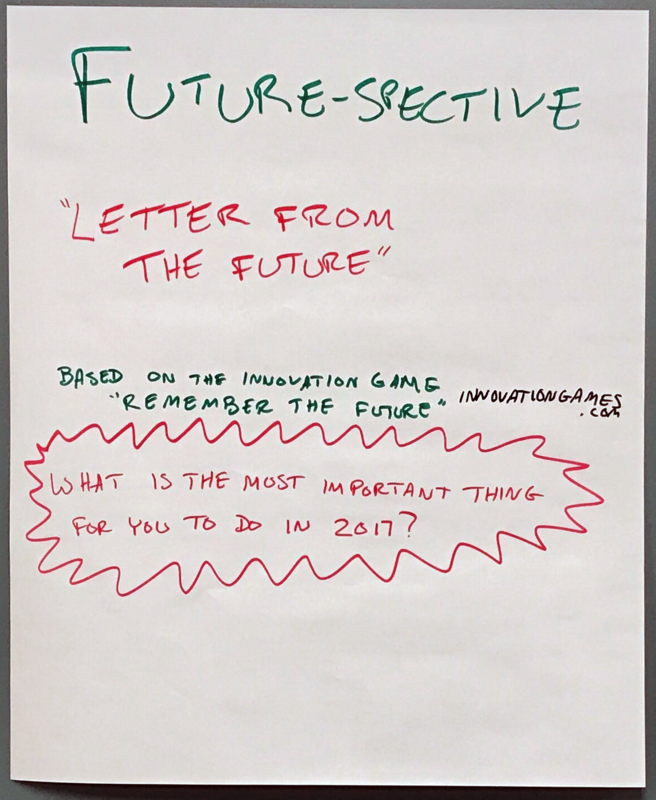 This is the San Jose Budget Games, an application of Innovation Games. 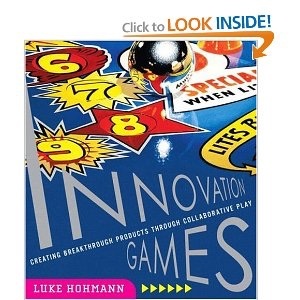 Innovation Games are another way to get the best out of people, to open space, to elicit creativity and the group-mind. They are games that get work done, that help people discover real solutions to hard problems. Stoos is an important Way of the Diamond Age. It is a group of people who have discovered that we are in this Work Hurts transition period between Industrialism and the Diamond Age. They explore better ways to create community and work together. 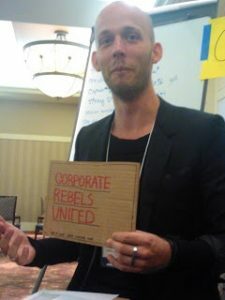 Corporate Rebels United and Rebels at Work are important Ways of the Diamond Age. Working from within large organizations, we wish to change our ways of working from Industrialism toward Diamond Age. These are the Ways of the Diamond Age, the Diamond Age-do. 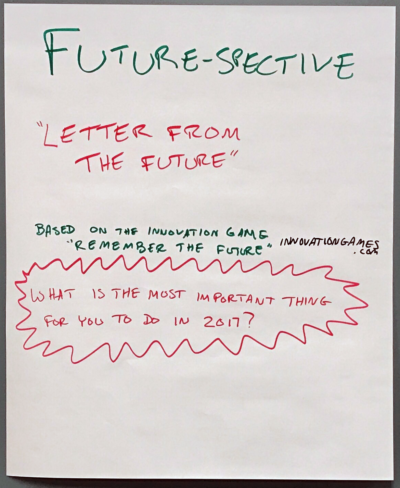 Agile, Open Space, Artful Making, the Core Protocols, NVC, and more: these are the tools of our transition from Industrialism to post-industrialism, from management in the era of scarce resources to the era of possibilities. If you can code it you can have it. We can do amazing things together. We can do great things together. Want to join me? I’m Richard Kasperowski. I want to connect with you. I want to meet you face-to-face in Boston, New York, New Haven, or anywhere else in the world. I want to video-chat with you, talk to you by voice, or through text. I want to explore the world of possibilities with you. Connect with me.